Summertime is a fabulous time with overflowing seasonal produce, especially sweet fruits. Peaches, plums, berries, and eventually apples are the delicious ware of the grocery store, farmer’s market, and roadside stand in the summertime. It’s easy to eat these fruits up without cooking them into a dish but what if you have a plethora that is about to go bad? 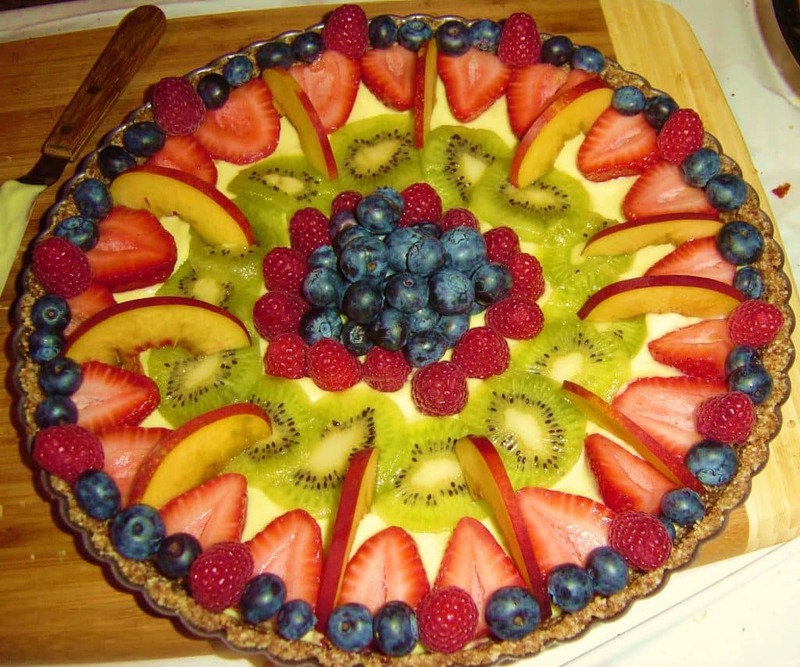 Consider today’s experiment: German Fruit Tart. This recipe is an easy way to use up the surplus of any fruit that you have on hand, and, like all my favorite recipes, it is super easy to make with great results. Cream the butter and the sugar together to that it becomes light and fluffy. This is one of my favorite parts, seeing the solids transform. Bean in the egg yolk. Gradually add the flour, a little bit at a time, until it forms a soft dough. Press the dough in the bottom and up sides of a pie plate. This recipe makes enough dough for a 10-inch pie plate, but you can a smaller plate and it’ll be just fine. Arrange fruit slices or quarters in dough with skin sides up. 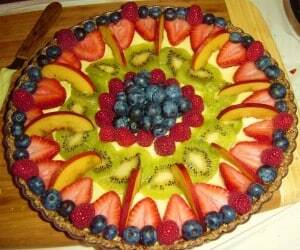 To fit all your juicy fruit soon turned gorgeous dessert, overlap the edges. Sprinkle the remaining tablespoon of sugar over the top of the fruit. Bake at 350 degrees for 35 – 45 minutes. It’s done when the crust is golden brown and the fruit is tender when poked with a fork. Note: If you are using apples, make sure to slice them as thinly as possible or they’ll be crunchy when the crust is ready to come out. I’m made this with plums and apples with fantastic results. But I can envision easily making it with peaches, fresh apricots, blackberries, and pears. I’d love to hear your fruit combinations after you’ve tried this. What fruits are local to your area? What interesting combinations can you imagine going on top of this buttery crust? This week, I’m writing to you on the road in Tipton County, Indiana. My husband is starting a new job here and we’re looking for a place to live. In less than two weeks, we’ll be moving here to re-settle our family. Naturally, we’ve been looking for ways to save money. Today’s experiment: Saving While Moving. This one isn’t going to translate into immediate saving but will give you instant peace of mind. We’ll be renting for several years while we’re saving up for a down payment. We’d love to not have to move again until then. One way to save yourself some trouble is to call the police department in the area you’ll be moving. Ask them if there are any areas of town or apartment complexes that you should avoid. They’ll know better than anyone the safest places for you to look for rentals. 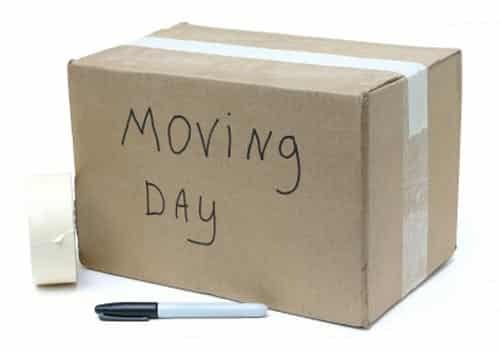 In the long run, you many save money that you would have spent on an additional move to get out of an undesirable situation. Before you move to your new locale, go by the visitor’s bureau for that town and let them know that you are thinking about moving into the area. They’ll give you information about city or town happenings and let you know all the attractive features of that location. 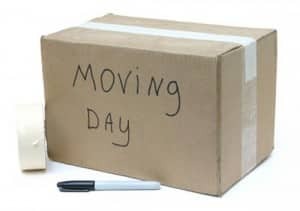 After you’ve moved, visit again and they may give you a new resident welcome packet with more information and possibly freebies. One friend of mine received a free month’s subscription to the city daily newspaper. Check out this website for rentals in the area you hope to be living. It’s just your average search engine with a twist. If you find your future home on their website tab that says “$100 Reward Card,” they’ll give you a $100 Visa gift card. My friend did this and used the card to buy a new vacuum cleaner and other items for her new home. I hope these ideas make your moving a little more pleasant. Wish us luck as we try to find a rental in the next two days! What advice would you add? When you’ve moved, how did you save money? When in doubt, go with one of these. They are simple and quick and can be made cheaply, which whatever you have on hand in your home. Place your vegetables in a greased pie dish. Layer the vegetables, then add any pre-cooked meat of your choice. Top with shredded cheese. Whisk together the eggs and cup of dairy as well as some salt and pepper (to taste). Pour the egg mixture over the vegetables. Sprinkle nutmeg on top. Bake at 350 degrees until a knife placed in the center comes clean. Mix all the ingredients together, adding one cup of milk measured out in the soup can. Pour into a greased casserole dish and cook at 350 degrees until heated through, about 30 minutes. You know salads. Throw whatever produce you have in the house together in a bowl. Let individuals pour olive oil and vinegar over their portions. Aren’t recipes so loose? You could hardly call them recipes. These recipes are what I use when I don’t know what else to do. I just use up whatever is already in my house and throw together a combination that seems like it will taste good. Here are some online resources for finding simple recipes that will become your family favorites and “go-to” dishes. A Year of Slow Cooking – This lady decided to use her crockpot every day for a year and document it in a blog. They recipes are easy and most of them are simply made with simple ingredients. A side note, every recipe is gluten free. 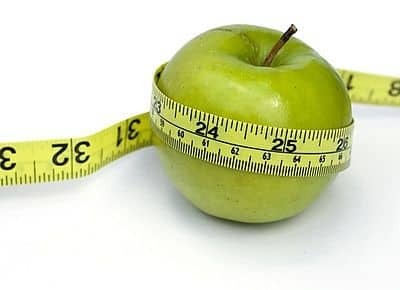 Simple Bites – An online blog that highlights food, not just recipes, but concepts about food. Each post is enjoyable, and I’ve gleaned some good information from them. Woman’s Day Magazine Recipes – These recipes are made for the average American woman, someone who is busy but still wants to make great food. I find a great recipe each time I check this out. It’s full of keepers. Delicious Living – This resource is focused on more natural living, which means their recipes are often choc full of produce. Although many of the recipes don’t seem that simple, I appreciate their focus on produce, which is cheaper than meat and easier to cook (in my opinion!). Aanna, I hope these ideas help. Enjoy your journey in the kitchen as you simplify! What advice would you add to mine? How do you keep things simple and frugal in the kitchen? Thanks for the question, Aanna. Your two goals of simplifying cooking and cutting back on spending are two goals of mine that I seem to be continually defining. Unfortunately, saving money often seems to complicate cooking and becomes more time consuming as you work on making ingredients and dishes from scratch. Here are some helps I’ve discovered. Today’s experiment: Simplify Your Cooking, Part 1. Have you ever noticed that every meal in America centers around meat? Watch a commercial for a restaurant and you’ll see that only meat is highlighted. It turns out that meat and products that come from animals (like butter, cheese, yogurt) are the most expensive out there. Each week when I sit down to write out our week’s meal plan, I choose one meat that I will buy that week and plan to have three or four dishes with that same meat. The other dishes will center around vegetables or beans, which are by far much easier and cheaper to cook than meat. I try to make sure that animal products will not cost more than a fourth of my food budget. How do I get the meat to stretch that long? Dietary recommendations are that you eat a portion of meat that is about the size of a deck of cards. We make sure on our plate that the vegetables outweigh the meat instead of the other way around. You can also save money by stretching ground meat in a slightly sneaky but nutritious way. For half of the ground meat you are going to use in a recipe, use the same amount of coarsely ground chickpeas (garbanzo beans). Simply pulse the beans a couple of times in a food processor or blender. I swear that no one will be able to tell the difference within the food dish. Just ask my husband. I love to try out new recipes. However, new recipes often mean that I have to buy a special ingredient or spice, one that I’m probably not going to find at Aldi and may not even find at Wal-Mart. I realized that new recipes were draining my food budget money at a quicker rate than I liked. Now, I limit myself to one new recipe each week. The rest of the week, we eat good old standbys that I know I can whip together quickly and cheaply. This is just some quick advice. Look for Part 2 for some recipe ideas and links to other sources for simple yet satisfying recipes. 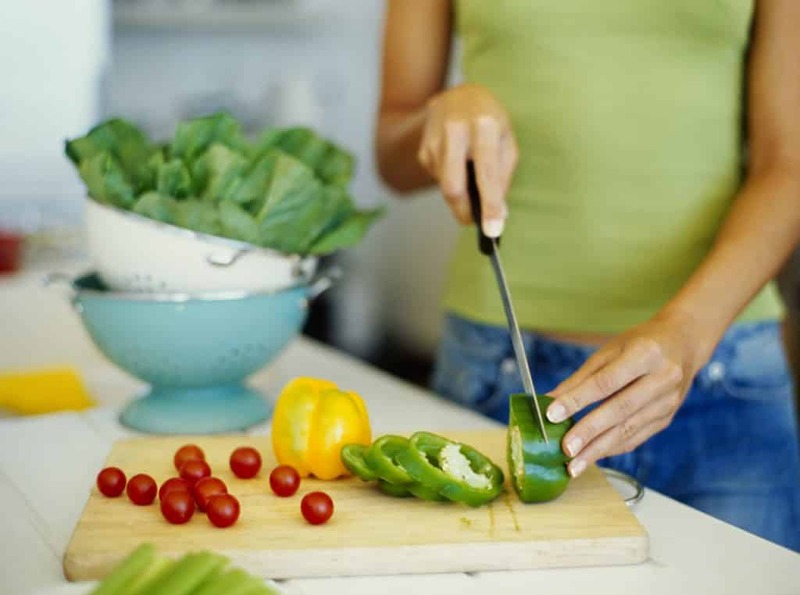 How do you keep your cooking simple, yet nutritious and delicious? How do you save time and money in the kitchen without sacrificing flavor and nutrition? When I was single, money was not important to me. Oh, yes, it was important in that I knew I needed it to pay the bills and eat. But I didn’t care about it enough to keep track of it or make sure it was getting distributed properly among all my needs. I know I wasted a ton of money during this time because I just did not care to pay attention to where my money was going. My family lives in a city where my husband says, “There is nothing to do here except go to Wal-Mart or eat.” This is very true as we have three Wal-Marts and an endless number of restaurants, but not much else by way of entertainment. It turns out that there are events happening in our town, but you just have to know where to look for them. Today’s experiment: Community Activities. Community activities can provide you and yours with cheap entertainment and give you opportunities to make memories, even if your night isn’t the best ever. FOR EXAMPLE. This past winter, our city hosted a free event where you could visit part of downtown that had been “transformed” into a street that might have been out of Dickens’ A Christmas Carol. This included live music, a live nativity, and a small petting zoo. Awesome, right? Totally. Except that the night they held it was so frigid that I thought my baby’s nose was going to fall off and we were too busy shivering to notice any of the beauty. We left early. But, boy howdy! Did we ever make a memory! You may avoid activities and events in your community because you think, ‘There is no way my community could put on anything interesting.’ Or perhaps, ‘All the people in my town are weirdos.’ Well, Friends, my husband and I make those same comments, but often we are pleasantly surprised that our broad, sweeping generalities of this city and its people fall flat. Take it from us, you’ll at least make a memory. In our town, the newspaper as well as an online community page are the good resources. I periodically check our city’s webpage to see what new events will be happening in the month. I always mark them down on the calender, even if I’m not sure we’ll attend, so I remind myself that I have the option. Keeping connected this way is a great way to have cheap entertainment. I will only take note of free or downright cheap events. Sure, there are some other events that look awesome that I might pass over, but I know that I don’t have to pay the big bucks to enjoy myself. If your city has a public library, a college or university, a community center, a museum, or a nature center, check out those places to find out what will be happening at them within the next month or next semester. You would be surprised at how many free events are flying under your radar simply because you aren’t looking. This month, I could have gone to a free Russian violinists’ concert or a free light show. I didn’t, but I could have. For free. What are other informational hubs in your area? How do you find out about community activities? This is a companion article to my previous one about using cloth diapers. Today’s experiment: Cloth Wipes. For me, this was a natural decision since I was using cloth diapers. Why pay for regular wipes when I wasn’t buying disposable diapers? Also, when I was using the cloth diapers, I couldn’t just stick the disposable wipes into the cloth diaper while I was working because it would eventually go into the washing machine too. Using cloth wipes has been cheaper and also more convenient for me. I just throw the used cloth wipe into the pail along with the dirty diaper and wash them along with everything else. These are SUPER EASY. I am not a seamstress, but I was able to do this project. At first, I tried to do it by hand. I finished one square, which took me days to sew, and decided to find someone with a sewing machine I could borrow. You can use terry cloth or flannel for this project. 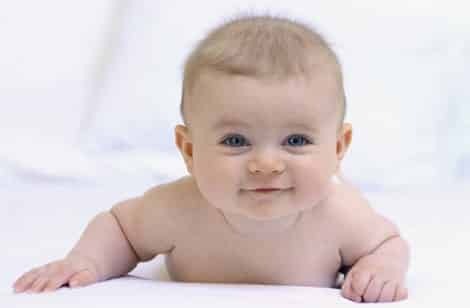 Either one will be soft of the baby’s delicate skin, but also be absorbent and clean up the mess. I used flannel as we had a plethora of flannel receiving blankets given to us when Phoebe was born. 1. Cut the cloth into 8-inch by 8-inch squares. If you have large hands and want the wipes to be bigger, simply increase the inches until you are happy with the size of the square. 2. Sew the edges of the squares with a zigzag stitch. This prevents them from fraying when you wash them. 3. Make enough so that you have sixty wipes. Umm, that’s it. I know, easy. If you want to, you can sew two pieces back to back to make them thicker and more absorbent. Or you can sew one piece of flannel with one piece of terry cloth to have a better scrubber on one side. That is up to you. I simply sewed up the sides of “one-ply” pieces of flannel. These work fine for me and I’ve never had any leakage. I keep my cloth wipes in a used disposable wipe container. When the baby are little and are just eating breast milk, they’re very easy to clean up with these wipes. When they start eating solids and it’s nicer to use a wipe solution. I spray this solution onto the square depending on how much liquid I think I’ll need. Use a funnel and pour these ingredients into a small size travel spray bottle that is more than 8 oz. (I found one in the travel section at Wal-Mart.) Make sure to buy one that is not clear so that the tea tree oil will not lose effectiveness by being exposed to sunshine. Shake and you are ready to go. I love these wipes because they never irritate my daughter’s skin and I always get just the right amount of liquid on them. Ready to borrow someone’s sewing machine? Will you use these yourself or make them for a friend? When my daughter was born, cloth diapers were not an option for us. We still lived in Europe and our water was unpredictable. When I imagined what cloth diapers would be like, I envisioned piles of dirty, stinky, wet cloths setting out in my laundry room. Not a pretty picture. We returned to the States when she was five months old. Since then, we’ve primarily used cloth diapers. I want to share my experience with you in Today’s Experiment: Cloth Diapers. Our motivation for doing cloth was completely to save money. Do I like rinsing out poop into the toilet? No. Do I like lowering stinky diapers into the washing machine? No, I do not. However, I do LOVE the savings. They are so much cheaper than disposables. And they are better for the environment. Bonus! We did not do any of those new-fangled, fancy cloth diaper systems that look like a disposable but are made of cloth. We went vintage all the way and did prefold cloth diapers because they were the cheapest option. Yes, diaper pins and all. To do it this way, you need about forty cloth diapers, three plastic covers, and at least one set of diaper pins. 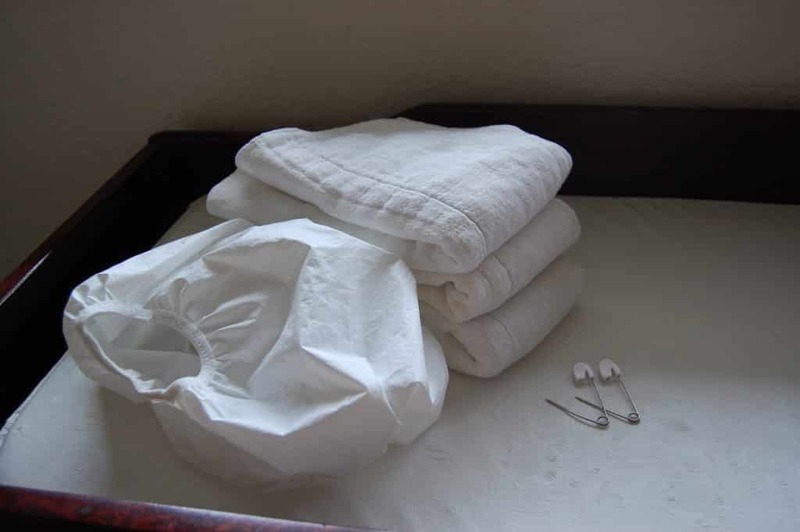 The diaper set that look like disposables and have snaps or velcro are simpler to put on, but require the same amount of effort to clean and cost a lot more. You can use the cloth diapers the whole time that the baby is in diapers. When they are newborn, use just one diapers, then double up when they get older. The plastic covers come in different sizes, from newborn to 3T. The best part of using cloth diapers is that you can use them with multiple children, so you are making an investment that is going to last many years. Is it hard to figure out? I’ll admit, the first of trying to pin those suckers was frustrating. It took some practice to get them pinned correctly so that they’d stay on. Fortunately, my daughter afforded me plenty of practice and I got the hang of it quickly. Now it is second nature and I hardly pay attention to what I’m doing while I’m doing it. What about the pins? Aren’t you afraid you’re going to poke your daughter? At first, this made me very nervous. But when you poke the pins through, you place your hand in between the fabric and your baby’s skin so that poking them isn’t a possibility. This means I’ve poked myself several times, but, more importantly, she’s never felt the end of the pin. The pins do get dull over time. To make them slide easily through the diaper, I just run the pin through my hair a couple times. The oil from my hair makes pin go smoothly through the fabric. Also, every couple months, my husband uses a knife sharpener to sharpen the edge of the pin which bends over after lots of use. Yes, the poop. If you have a baby, you are going to deal with poop… everywhere… no matter what, no matter what kind of diapers you choose. It is a fact of life. No, I don’t like looking at and smelling poop, but it’s going to happen. I might as well be saving money while I do it. How do you clean the diapers? I rinse most of the poop off in the toilet. I keep all the diapers in a diaper pail that is next to my changing table. 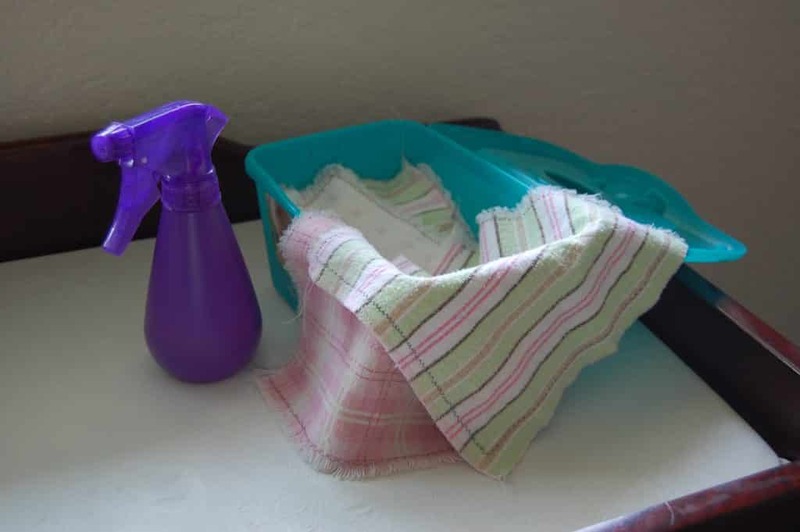 Whenever the pail gets full (most of the time, every other day), I wash those diapers with my regular cloth cleaning regimen with one addition. I use hottest water, throw in some Oxy-Clean, let them sit for half an hour, then wash them on a “Heavy” setting and add an extra rinse in there. Per directions on the package, the plastic covers should not be washed in with the diapers because the bleach (or Oxi-Clean) weakens the plastic. I use a wipe to clean the poop off of the plastic cover, then wash them in hot water along with a load of towels. The plastic covers do not need to be washed often. When they smell, it’s time for a wash. Otherwise, if they are just a little moist, I turn them inside out and let them dry out. What about traveling? What about church or day care? Do you use cloth diapers exclusively? No, we sure don’t. When we travel, we consider using disposables as part of the vacation package. I do pack cloth ones for the church nursery and they don’t seem to have a problem with that. Also, when my daughter has been sick, I’ve used disposables for that time period. What’s your experience with cloth diapers? Do you use disposable, prefold cloth, or fancy sets?